Who are the Addison Singers? 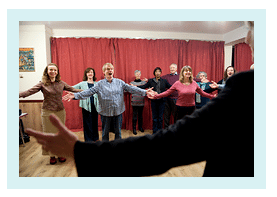 New members are always welcome to join the Addison Group of Singers, which is made up of three different singing classes and four different choirs for singers of all ages, abilities and musical interests. It was founded more than 30 years ago with David Wordsworth as its Musical Director since 1995. The Addison Singers normally operate on three 10-week terms (the same as the schools) with a concert or recital at the end of each term. Rehearsals are held in Hammersmith on Monday (Jazz and Vocal Technique), Wednesday evenings (Classical Choirs and Learn to Read Music class ) and Thursday afternoons (Musicianship for Singers class); the times and subscriptions depend on which choir or class you join. Concerts are usually held in West London – Turnham Green, Notting Hill and Barnes. Any potential new member of our non-auditioned choirs is welcome to try a 'taster session' during either the first or second rehearsal of term to see if they would like to join a choir or class. Please let the Membership Coordinator know if you would like to try one rehearsal or class. If you are trying a choir, we will arrange for you to share music with a 'buddy' who will be able to answer any questions you may have. At the end of the session we hope you will decide to join and you will be asked to pay for the full term (or pro rata if not the first session). Chamber Choir bursary holders must also join the Oratorio Choir and commit to singing at all Chamber and Oratorio Choir performances during the year. Jazz Ensemble bursary holders must commit to singing at all Addison Jazz performances during the year. These may be jointly with the Jazz Choir or separately as the Jazz Ensemble. 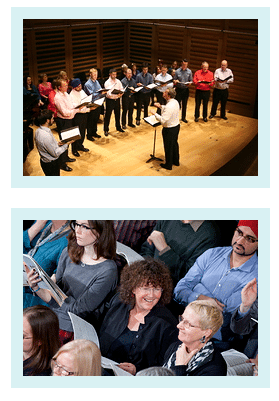 The Oratorio Choir is a non-auditioned mixed choir of approximately 90-100 singers, open to all singers, that performs much of the standard repertoire as well as a wide range of new and more recent music, including several works written especially for them. The Chamber Choir is a small mixed choir of approximately 30-40 members for skilled singers exploring a varied repertoire from the Renaissance to the present day. A high level of commitment and rehearsal attendance and practice at home is expected. Entry is by informal audition with the Musical Director. The Jazz Choir is a non-auditioned, all-female group of approximately 45 ladies that explores jazz songs from the 1930s onwards, plus other popular music. There are a variety of approaches to develop group arrangements and fluency in jazz performance. The Jazz Ensemble is a small jazz singing group for experienced men and women singers. A high level of commitment with rehearsal attendance and practice at home is expected. Entry is by informal audition with the Jazz Ensemble conductor. 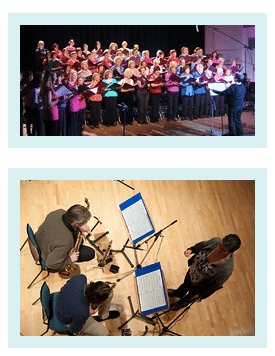 No audition is required for any of the classes, which are open to all singers of mixed ability, except the Learn to Read Music which is aimed at singers who are new to singing with little musical knowledge – great to help gain confidence whilst singing with the Jazz or Oratorio Choir. The Learning to Read Music class is primarily for those people of all ages who are new to music and singing or who wish to improve their sight reading. The classes cover basic music reading and theory, understanding keys, scales, chords, etc. This is not a singing class. Beginners often join the Oratorio or Jazz Choirs concurrently with this class in order to sing and put the music theory into practice. (NB: This class runs for 8 weeks only). The 45 minutes Vocal Development class is suitable for people returning to singing, those who sing in a choir or aspire to join a choir and want some vocal practice first, as well as anyone wanting to learn good breathing techniques and warm up routines. This will also be useful e.g. for public speaking, teaching and for confidence building. The choice of group repertoire will be made within the group under the tutor's guidance. 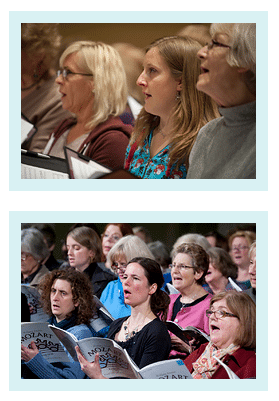 The Vocal Technique class includes warm-ups, breathing exercises, scales, group and individual singing. It is ideal for those wishing to improve their singing technique and gain the confidence and skill for solo singing. The repertoire covers classical, jazz and popular music, by mutual arrangement with the Tutor. This class is not suitable for beginners, who should start with the Learning to Read Music class or the Vocal Development class.